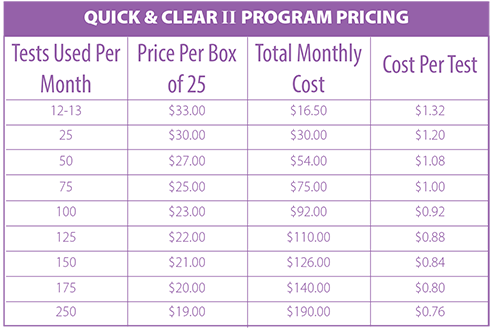 Pricing of the Quick & Clear II tests is based on the quantity used and if you choose to have automatic shipments. - Combine with automatic vitamin shipments and save even more! If you order both tests and prenatal vitamins, the quantities combine and you get the next pricing level on both. For example, if you order 5 boxes of tests a month and 1 bag of vitamins, you will be the 6 box pricing (150) on tests and the 6 bag pricing (180) on vitamins! See the enrollment form for more information.